Tribes Overall: "It surpassed my expectations. An excellent safari. We saw wonderful things." Tribes Service: "I am very happy with Tribes having had an excellent trip to Brazil a few years back and seen jaguars for over 5 hours, and now this trip was excellent from the safari/wildlife/birdlife point of view. " 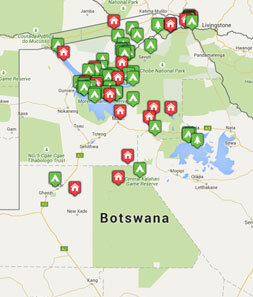 Guides: "Pat on the Letaka mobile safari was excellent. The guides at Kubu lodge were good, but not in the same class at Pat." Social & Environmental Responsibility: "I hope so and hope that our money helps to protect all the wildlife and the environment. " A lovely place which I really enjoyed. Lovely soft beds and excellent staff and a superb situation overlooking the river. Excellent for the food and camp staff, but terrible tents and camps beds - both past their sell-by date. The zips were very stiff and hard to get up and down. The beds were absolutely dreadful - thin mattresses which slithered around. They need to be got rid of. TRIBES REPLY: We\'re so sorry to hear about the standard of the tents and beds. This is very unlike Letaka, and this has now been taken up with them. They send Mary their unreserved apologies. New tents and beds (and mattresses) are being delivered at the start of August 2014. Tribes has seen now photos of the new, bespoke beds and the mattresses are all thick and comfortable. Zips do break on safaris such as this, but the team has a mending kit with them. Letaka are going to ensure that guides check all tents whilst on safari and mend anything that requires it. It is really regrettable that Mary had such a bad experience with the camping equipment on this trip, but Tribes are now reassured that this will not happen again due to the measures put in place. "One early morning a pride of 6 lions walked into our camp as we were about to leave. they came within feet of us! They were not remotely aggressive, just curious. I could have touched them - lovely!" "We followed 2 leopards for about 2 hours. She was on heat and they mated at least 12 times. The male stopped and drank at a little stream. A wonderful experience. We also saw 2 leopard brothers up a tree where they had hauled their kill - an impala - and we watched them for ages. And then there were the 2 cheetahs we watched for about an hour, sitting under a mopane tree, and the hyena pups, and the wild dogs, and lots of elephants close up ... "